“Of course in the UN report my name was mentioned as Vanni Commander but no allegations against me. In fact, Radhika Coomaraswamy, who was the Under-Secretary-General of the United Nations, Special Representative for Children and Armed Conflict until 13 July 2012, told me that there is ‘nothing against you'”, says retired Army General, Jagath Jayasuriya. 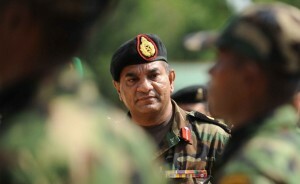 Jayasuriya who was in a center of a new controversy after the International Truth and Justice Project has filed war crimes charges in Brazil and Colombia against Sri Lanka’s Ambassador in Latin America, Jagath Jayasuriya, for his role in the final phase of the civil war in 2009, made above remark with an interview with Ceylon Today. I was the Vanni Commander. I looked after the Internally Displaced Persons (IDPs) providing logistics but I never commanded troops on the front issuing orders to fight here and fire there,” he told journalist Sulochana Ramiah Mohan. The last week’s lawsuit filed in Brasilia and Bogotá alleges that General Jayasuriya bears individual criminal responsibility as the commander of units that committed repeated attacks on hospitals, acts of torture and sexual violence, enforced disappearances and extrajudicial killings. “It is an outrage that a man like this, named in UN reports, should be sent as a diplomat abroad and accredited given what he has done. The International Truth and Justice Project (ITJP) and its Latin American partners would have liked to see the General stand trial but instead we understand he’s suddenly fled the region and returned to Sri Lanka,” said the ITJP’s executive director, South African human rights lawyer, Yasmin Sooka. “If he really believed in his innocence, General Jayasuriya would have remained in post and faced the judicial process,” she added “And if Sri Lanka is really committed to rule of law and accountability this is the moment for them to charge him”. Many charge that there was a Joint Services Special Operations Headquarters or the JOSSOPH Camp in the Vanni functioning as a torture chamber. It was right under your command, isn‘t it? A: Yes. In the late ’80s it was there. I cannot remember the Commander at that time. It was a small camp that was established as a complex for joint operations over a period of time. It was the only Army establishment at that time near our Vavuniya Airport. Otherwise, it was the Air Force that was using it. When there was a requirement for Army presence there, it was the Army Brigade that later made it into a camp and my Security Forces Headquarters was installed in that complex. It was one of the bases in the whole complex. But, there were so many other Special Forces including intelligence, artillery, armoury and their camps, and the Air Force runway all inside the complex. Was there a torture camp inside there? A: That allegations came up since intelligence were there and may be they held interrogations inside. That is why it is interpreted that way. The allegations pointed to me because I had my headquarters inside the same complex which I was responsible for. But there were Commanders at various levels in other camps in the same premises. So, if something had happened in those camps I am not responsible. Overall, weren‘t you in charge of this camp? A: Overall in charge was the Vavuniya Brigade Commander who was responsible for the security. So it was not under you? A: No. I was not the one in charge of security. There was one security guy to look after the whole thing. We looked after the other small establishments. What many say is when torture was allegedly taking place there, I should have heard somebody shouting and screaming through the walls. They think I was staying next door. So you‘re saying you were not responsible for any torture? A: How can I be responsible if somebody else was doing it? The entire complex was not under my command. So basically you did not know what was going on in that part of the camp? Is it because you were the Vanni Commander they are pointing at you? A: What can I do? I mean when I am in a particular place and things are happening 100km away how can I know about it? As the Vanni Commander, I was in Vanni near the airport and the fighting took place in Nandikadal, which is over 100 km away. In an interview in SP‘s Land Forces Magazine in February 2010, you claimed: “As the Security Forces Commander Vanni, the entire northern operation was conducted in the tactical area of responsibility that came under my command. I was actively involved in the ground operations executing the directives from Army Headquarters and the Ministry of Defence.” Do you stand by that statement? A: Yes, up to that particular date I was referring to, I was in charge. A: At the final stages of the war, I got instruction from the Army Commander that I hold no responsibility of an Operational Commander. A: I think it was February or March. How do you think Sri Lanka can clear its name? A: I think the government should do it. How will your name be cleared? A: I cannot clear it. I don’t attend UN sessions. A: If somebody holds an inquiry or if something against me is proved, that should be investigated. Then I have to give evidence and the person who complains also must give his evidence. I know my side of the story. This has not been done and various allegations are levelled against us by other countries. I may also ask what evidence do they have against me? Just because someone has charges against me, it does not mean that I have to accept it. Until I am found guilty, I am innocent. This is where the Special Court comes into play. You would like a Court hearing? A: Whatever. If the country has accepted a mechanism to sort it out, we have to face it. If we are summoned, we cannot say we cannot go for that inquiry. All must be lined up and inquired. Why do you think there is an agitation for a special court, which is meant to clear everything, related to war crimes? A: I don’t know what you mean by a Special Court, but whatever the Court is, then they should do that. No problem. What we want is, to have a Court or whatever name it goes by (or anything else) and finish it off. Why did you make me see that Vimeo? I want to believe that we launched a “humanitarian operation”. After all, it is conceded that the Tigers also were guilty of atrocities. Well, most of them have had to pay the supreme penalty: dying in this horrible way, those getting killed in the final stages knowing that their entire movement was getting destroyed. Their ends were very different from the suicide cadres who believed that their “cause” would triumph. But what of the civillians? The children, the elderly. SOME may have sympathised (NOT a crime!) with the Tigers – because of what we did! There were others, concerned and intelligent, who didn’t approve of the Tigers at all, as we were reminded by this article written only 4 days ago. We can’t bear to face up to the truth, and it is good that this Vimeo lasts only 15 minutes. I voted for my (no, OUR) President, because I wanted him to give us justice, leading to reconcilliation. Now he proclaims that not ONE soldier is anything other than a war hero. It will be political suicide to execute soldiers – I grant that. But to not even investigate? That I cannot accept! Thanks to No Fire Zone Team. Thanks to the soldiers who took some of the videos. However the hidden national pain lingers on whether the family is Sinhalese, Tamil or Muslim. The country had lost its purpose long ago . Was there a purpose in the first place?